Good thing getting cozy is going to be big in 2017: There are loads of great healthy books coming out this year. Make an Ayurvedic cider latte, grab your super-hygge blanket, and start your Amazon/library/independent bookstore wish list, because these are the wellness-approved page-turners you’ll want to curl up with throughout the year. 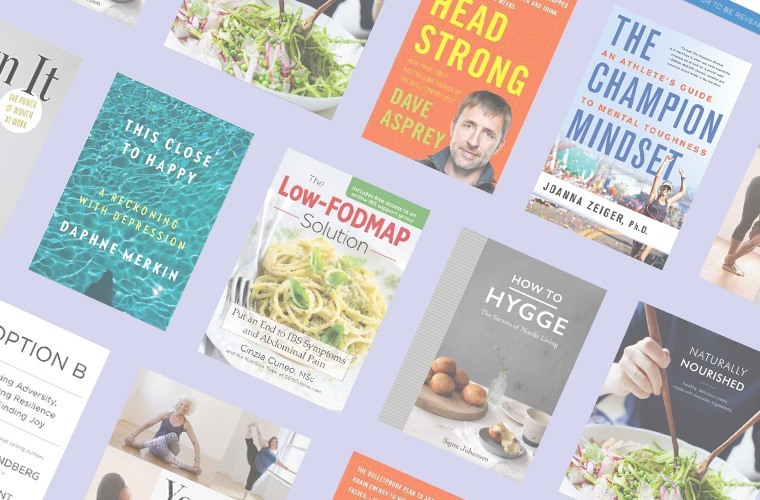 Keep reading to see the 10 best wellness books coming out in 2017. If the election has you feeling like the glass ceiling will never be shattered, Own It will lift your spirits. Author and Ellevest CEO Sallie Krawcheck gives her tips on finding your inner power and using it to slay at work—even if your boss is a sexist jerk. Finishing this book will leave you feeling more confident and courageous than ever. It turns out more time, money, and resources don’t necessarily lead to happiness—or a promotion. In Stretch, Rice University professor—and psychology-slash-management expert— Scott Sonenshein brings forth scientific evidence as to why people succeed more with less. Consider this next-level Marie Kondo-ing. Journalist Daphne Merkin has written openly about her struggles with depression for The New Yorker and The New York Times Magazine, but her new memoir gives a truly intimate look into her life. From experimenting with various treatments to discovering passion in the midst of sadness, it’s honest, gripping, and leaves an impact. Everything in My New Roots‘ Sarah Britton’s cookbook is plant-based, delicious, and available at your local grocery store. (Save your maca and tocotrienols for the Moon Juice Cookbook.) This book is sure to come in handy on those busy weeknights when you need something quick and easy. Whether you’re a bonafide triathlete or just trying to hold a plank the full 60 seconds, you know mindset can make or break your fitness goals. So what sets the people who succeed apart from the people who don’t? The answer lies in this book, with tips on prepping your mind for whatever you want to achieve. You got this. For the one in five Americans with IBS, this new cookbook will be a game-changer. Sticking to a low-FODMAP diet can be overwhelming—it seems like everything is off limits—but this book debunks that belief. Inside are 125 recipes and a 4-week meal plan. Bulletproof founder Dave Asprey has already given some tips on how to biohack your life (AKA the Silicon Valley-beloved belief that you can take control of your biology by changing your environment). Head Strong takes it one step further, revealing how cravings, moods, mental agility, and living without inflammation are all controllable—you just have to know what to feed your body. Hooked yet? Ready to take your “leaning in” to the next level? Sheryl Sandberg is back with another revolutionary book, this time about how to move forward after a setback. It’s certainly something Sandberg knows something about: After her husband suddenly died at age 48, she wasn’t sure how to move at all. But Sandberg picked herself back up and came up with an “option B.” And this isn’t just Sandberg’s story. She interviewed an array of social scientists and includes personal stories from a variety of people who were resilient in the face of very different adversities. Prepare to feel inspired. Here’s something lovely for your coffee table: Yoga Bodies features gorgeous photos showing that yogis come in every shape, color, size, background, and skill level. Some photos will make you gape at the amazement of the human body. Others will make you smile so big you won’t be able to resist sharing on Instagram. And all of them will make you feel really, really good about taking it to the mat. Looking for more ways to transform your 2017? Ryan Gosling’s trainer shares three tips for taking your at-home workouts to the next level. Plus, how to create a goal-setting vision board.